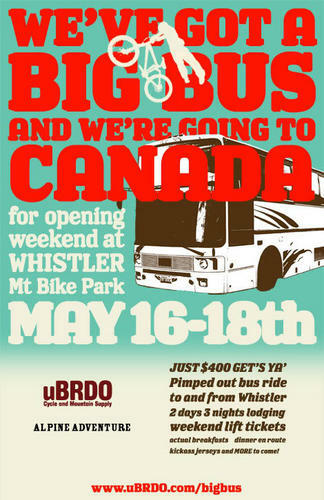 whistler bus opening weekend anyone???? Discussion in 'Pacific Northwest' started by bikerpunk98199, Mar 26, 2008. Hey guys, just thought you might want to check this out. sounds like a pretty good deal. 400 for everything except lunch and sat. dinner. There will also be drinks on the way up for 21+ and then kiddy drinks as well for those younger. Check out the uBRDO webstie for updates. Where is the group staying? Room arrangements? What happens if WBP (gasp) doesn't open that weekend? Do we just head up the next weekend? Where does the bus leave from? We will be staying at the marriott residence inn. We will be in 2 bed 2 bath condo's. 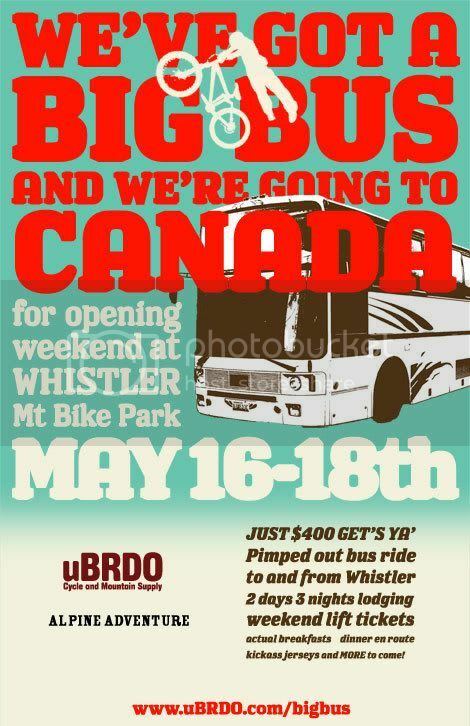 Whistler will be open, I talked with Tom Pro and he said the bike park will be open that weekend for sure. Is there a limit to how many people can come? Nevermind, I just checked the website.